Another word for ‘ideology’ is ‘faith’. And the tremendously convenient thing about faith of any kind is that you don’t have to worry about anything as absurd as how the world actually is. With an ideology clasped reverently to your bosom, you can confidently step out into the world knowing that, whatever the reality, you have an answer for every question, wherever there is doubt, you have certainty, and where there is darkness, you’ll have a torch. To change t(r)ack, when one is imbued with the fierce flames of ideology, it is as if one is the boiler in a run-away steam train, hurtling uncontrollably down the tracks, destined to crash through the walls of reality as they loom one by one in front of you. And because you have faith, it just doesn’t matter! the government's policies have increased his personal wealth. 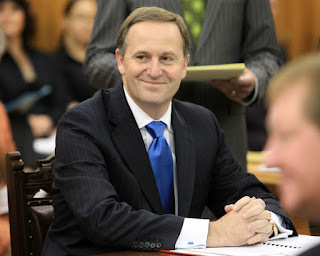 All that is by way of saying that – yet again – New Zealand finds itself the passenger aboard an out-of-control ideologically-driven steam train, with a government shoving coal into the boiler with the furious intent of a madman. Hell-bent on pursuing the prescribed economic policies of yesteryear, the government is giving nary a thought to the possibility that, just perhaps, what they are doing is destroying whatever chance this country might have of salvaging the last vestiges of a functioning economy. But don’t take my word for. Take Bernard Hickey’s – for one thing, he’s very clever, and for another, his writings have all the pungency of sheer good sense. Read his article, and then look aghast at the shameless jib-jabbering of this government as it crashes through yet another wall, laughing the hysterical laugh of the ideological zealot.